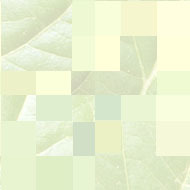 Click on the thumbnail photo for a bigger view. A. "Let Your Light Shine" 46" x 46", 1997 by Deanna Spingola. Foundation pieced. Displayed at the 1997 Fort Washington, PA. show and the 1997 IQF show at Houston. 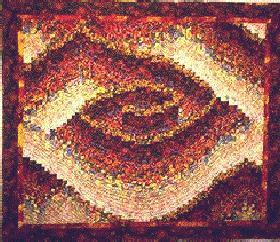 It was also in the "Quilts of Illusion" exhibit at the Fitton Center for Creative Arts in Hamilton, Ohio in July and August 1997. 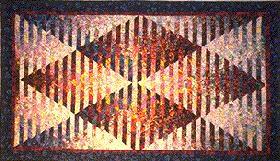 It was also at Quilt America 1997 and Paducah 1998. B. "Vertigo" 43" x 43", by Deanna Spingola 1995/6. Displayed at AQS, Paducah 1996. Foundation pieced. 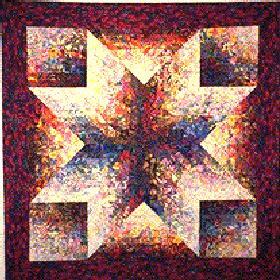 This quilt won first place in the NQA 1996 in their theme category - Watercolor Quilts. C. "Tribute" 70" x 41 1/2", by Deanna Spingola 1997. I took a class from Caryl Bryer Fallert and made a very small "Illusions" quilt then decided to make a larger one using watercolor style fabrics. Foundation pieced. D. "Eye of the Storm" 55 1/2" X 48" by Deanna Spingola. 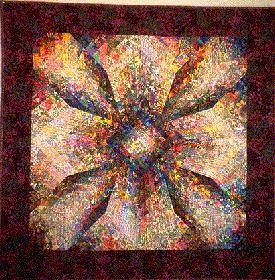 This quilt is based on the photo of the quilt "Hurricane Georg" by Georgia Schmidt which is in the book "Bargello Quilts" by Marge Edie.